Kybella® is an FDA-approved injectable for the reduction of fat under the chin (submental fat). For some individuals, genetics have “blessed” them with the tendency to accumulate fatty tissue in the upper neck and under the jaw. This can cause a person to look heavier or older than they really are. This less-than-desirable nickname is given to the fat and loose skin that can develop under the chin. As time passes, the aging process causes fat to grow in this area for some people. In pictures especially, clients of ours are very sensitive to submental fat because it looks like a double chin from certain angles. A turkey neck is generally a genetic anomaly that is passed down to family members, but the natural aging process can also cause it. Muscles in the neck and under the jaw begin to relax as the body ages. For those who do not have a genetic component, facial muscle exercises (such as face yoga) can help. Loose skin (mild cases) as well as extra submental fat can be greatly improved with Kybella. Kybella is injected into the area under the chin. The substance, deoxycholic acid, is carefully placed in a grid pattern by the injector so that fat is dissolved evenly throughout the area. This helps prevent uneven distribution of the substance during treatment. A plastic transparent overlay is placed on the skin under the chin to help guide the injector so that the injection sites are placed as suggested by the makers of Kybella. The syringe is filled with a specific amount of deoxycholic acid, and the injector has been trained on precisely how much to inject into each of the dotted areas on the adhesive overlay. © Valentina R. - Fotolia.com // Model. Not actual results. Kybella is a substance that dissolves fat cells and destroys them. Once the fat has been destroyed, the body carries the waste materials away. The good news is that once the body removes these materials, they are gone for good. Treatment is done about four to six weeks apart, and most people can achieve their desired results with just two to four treatment sessions. Individual treatment needs will vary depending on your age, how quickly your body carries away the destroyed fat, and the degree of muscle tone under the treatment areas. Since swelling can last up to one week, be prepared to avoid working out or doing anything strenuous for a few days after treatment sessions. Some tenderness after treatment is normal, and usually subsides within a few days after each session. For a full list of potential side effects, please ask a licensed medical professional to provide this information. Kybella can help the skin tighten up, so mild cases of skin laxity will improve after treatment occurs. When you compare fat removal and skin tightening via liposuction, Kybella offers a much faster recovery time. Although results are not equivalent to liposuction treatment, Kybella injections are effective in reducing fat under the chin. 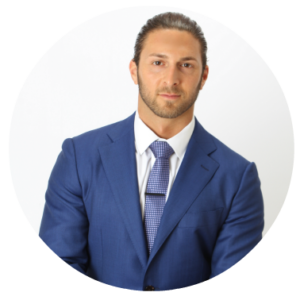 James Christian Sardelli, RPA-C is an experienced injector of Kybella and other wrinkle reducing injections such as BOTOX® Cosmetic and fillers. He is also a certified Vampire Facelift® provider. See his before and after gallery to look at real results…then give us a call to have your very own 5-star experience in Long Island or NYC. Simply text or call our Cosmetic Concierge 24/7 at (917) 860-3113. James Christian Cosmetics is located in Queens, Brooklyn, the Bronx, and Manhattan as well as multiple locations on Long Island. *BOTOX® Cosmetic and KYBELLA® are registered trademarks of Allergan, Inc. The Vampire Facelift® is a registered trademark of Charles Runels, MD.